The eroded limestone dune of the east coast. 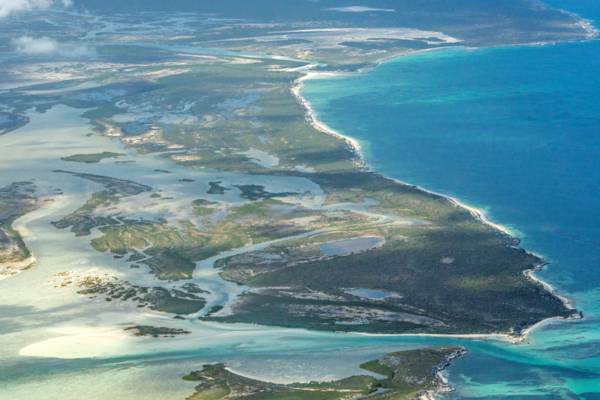 This long and narrow cay is located between the peninsula of northern South Caicos and East Caicos. The eastern coast of this small island is comprised of soft, crumbling limestone bluffs, and the western side is largely mangrove wetlands. Some of the finest kayaking in the Turks and Caicos can be found off the northern end of McCartney Cay. Landmass is roughly 600 acres. McCartney Cay is a private island, although there is currently no development on the island. Historically, this island had a rather unfortunate name and was renamed in the 1990s after JAGS McCartney, the nation's first Chief Minister and the first National Hero. Iguanas are present on the island, and are considered a genetic reservoir critical to the conservation of the unique Turks and Caicos Islands Rock Iguana. McCartney Cay, Turks and Caicos. Last reviewed by an editor on 2 January 2017.